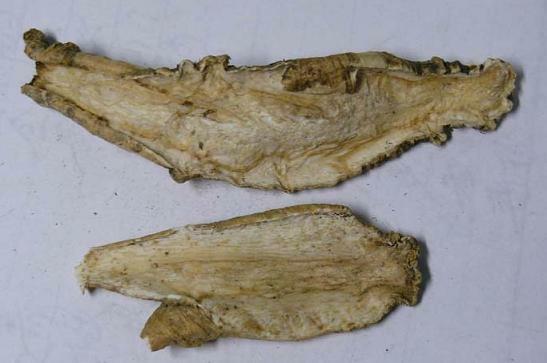 The drug is the dried root of Codonopsis lanceolata (Sieb. et Zucc.) Trautv. (family Campanulaceae), growing in woods, damp soils along creeks, and distributed in Northeast China, Northern China, Eastern China and Henan, Hubei, Guangdong, Guangxi. Sweet, pungent, neutral; spleen and lung meridians entered. Resolve swelling, remove toxicity, discharge pus, eliminate phlegm and promote milk-secretion. Scrofula, leucorrhea, boils, pulmonary abscess, acute mastitis, appendicitis, oligogalactia, tonsillitis. Decoct 15~60 g, 45~120 g with fresh product. Proper dosage is for external application, pounded for applying with fresh product. It is contraindicated for the early stage of external pathogens and people without sweat. It is antagonistic to Li Lu.